As a child I was given once given the honour of arranging the nativity scene - a task I undertook with great enthusiasm. I started by adding extra animals, plastic lions and elephants and such, eventually graduating to dinosaurs. I figured they were all God's creatures so the more the merrier, baby Jesus wouldn't mind, right? Still, since they were dangerous creatures I felt it prudent to add some extra security, so Jesus was guarded by Chewbacca, Grimlock kept the three wise men in line and a full packet of WW1 infantrymen were fanned out around the manger in what, to my child mind, were strategic formations. My mother wasn't happy, to say the least, but my grandmother found it hilarious. So much so she decided to make it an annual tradition. Visitors to my grandmother's house found it weird that her manger was full of plastic soldiers and Transformers, which is probably why she liked it so much, though, as you'll see, Christmas is full of weird traditions. Of course there's no pudding until after you clean your plate. Don't like eating Brussles sprouts? Well at least you're not in Greenland where traditional Christmas fare includes raw whale blubber, known as Mattak, and Kiviak, a dead sea bird that's been rotting and fermenting for months – bon appetit! Western culture is, without a doubt, the biggest Japanese obsession of all, but rather than emulate it they prefer to hijack it and make it their own. Which is a polite way of saying they take something familiar to us and turn it into something uttery bizzare. Therefore you'll see plenty of Christmas trees and Christmas cakes for sale, but you'll also see plenty of other strange traditions that seem to have no connection to Christmas whatsoever. Take the Japanese Santa Claus, or Santa Kurōsu, as he's known. Japanee images of Santa Claus may seem strange to Westerners, but that's because in Japan they've merged him with other native characters, including the Orient's favourite jolly fat man, Buddha. A bag of coal is the least of your worries in Austria where Krampus, a huge terrifying demon with goat horns and hooves who's essentially the anti-Santa, punishes naughty children by beating them with a stick, drowning them or dragging them straight to hell. Ok, night, night kids, sweet dreams! Stranger still you have caganers, tiny figureens with their trousers down, backside bared and doing what bears do in the woods without modesty. These are said to be symbols of luck, fertility and good fortune (not exactly sure why) and are actually placed in with nativity scenes. So here's Jesus, here's Mary and Joseph, here's the Three Wise Men, and here's a garden gnome taking a dump. Even as a child I would have found that strange. With a one in ten chance of winning a prize and a prize pool of approximately $3 billion it's easy to see why. 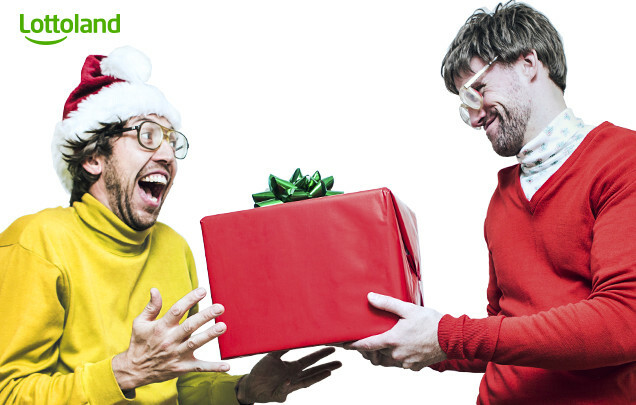 You can now enjoy the same festive generosity here at Lottoland by betting on the results of the Spanish Christmas Lottery, with odds of just 1 : 100,000 of winning the jackpot, a.k.a. El Gordo!